Because of IDM network consists of 167 active nodes includes 42 backbone containers, 93active distribution cabinets and 32 NGA cabinets), the network consumes much of electricity. In containers, two air conditioners maintain adequate temperature and humidity, DWDM equipment consumes max 3KW of electricity, a router consumes max 16.8 KW. In addition, each 93 active distribution cabinets also requires electricity to operate correctly which has 8.4KW router in the cabinet and 32 NGA cabinets also require electricity. Therefore, reducing the cost of electricity is a key part of the cost management in IDM operation. 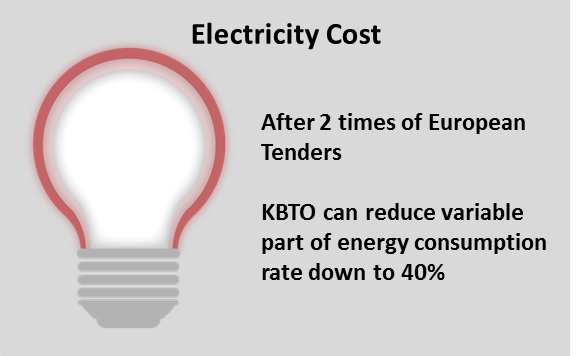 In order to lower electricity cost arises from active node, KBTO contacted the agency(called „MAE" - Mazovian Energy Agency) governed by regional government. MAE formed the basket among big electricity consuming entities including local government, public institution, culture and environment research agency, schools and etc. Based on this formed basket, there had been two times of European Tender to determine electricity supplier. As a result, two independent suppliers were selected as a unified supplier for KBTO. We were able to lower the rate per kilowatt about 40%, which helps the company to minimize electricity payment.